At this year’s ATA Show in Louisville, Kentucky, I only noticed a couple of broadheads that had a radical new design. One of these broadheads is the Innerloc Shape Shifter broadhead. It’s “outside the box” design features a clear, brittle, exoskeleton plastic shell that conceals the entire mechanical broadhead while ensuring the broadhead flies exactly like a field point. It basically is a field point until impact. As you can see in the photo above, the clear, plastic exoskeleton shell encapsulates the mechanical broadhead while it is in flight. Upon impact, the plastic shell disintegrates unleashing the 3 bladed, 1 1/4 inch cut mechanical head. The razor sharp blades are then free to do some serious damage. Immediately following the ATA Show, Innerloc sent us some Innerloc Shape Shifters to try out. With only a few days left in the season, 3 of our staff shooters took to the field with them. Within two days, we had the results we were looking for; two dead deer. Let’s take a look at the results. Our first success with the Innerloc Shape Shifter was thanks to Shootingtime.com staff member Chris Haas. Chris took a doe, but did it at an usual angle. The arrow entered the neck area, tore through the vitals, and passed through the opposite rib cage. This arrow took a path of very high resistance and would have been a complete pass through but 2 inches of the arrow stayed in the deer. The deer ran approximately 25 yards and left an impressive blood trail. The day following our first kill with the Innerloc Shape Shifter, Staff Shooter Jim Putnam arrowed a nice doe. In another path of high resistance, Jim’s arrow entered the shoulder and stopped just outside the opposite rib cage. This deer ran a total of zero yards. Dropped right where it was standing. Have a look at the entrance and exit hole. With these two deer kills, we discovered a few things. This broadhead, due to its design, flies extremely well. Both hunters hit right where they were aiming and successfully harvested their deer. Another thing we noticed were that the entrance holes were pretty small. This is good and bad depending on how you look at it. As far as an orifice for blood flow, a small hole may not be that desirable. On the other hand, if the blades open up after passing through the blade dulling rib bones, you are guaranteed razor sharp blades when it matters. Both arrow routes on these deer presented a good penetration challenge and we thought the Shape Shifters performed well. We speculate that other broadheads would have caught more blade dulling resistance on entry and probably would not have penetrated as far as the Innerloc Shape Shifters. 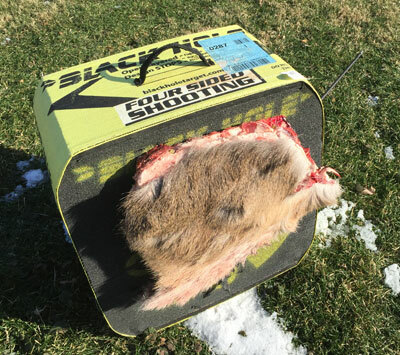 One question that popped up when we examined this broadhead was, “Will the plastic exoskeleton shell make the Innerloc Shape Shifter deflect off deer when shot at angles?” To answer this question, we did a field test with an actual side of a deer. As you can see, the Innerloc Shape Shifter stayed on trajectory, took out 1 1/2 rib bones and penetrated extremely well when shot at an extreme angle. In summary, we think this is a great broadhead. It may not be for guys who desire a huge entry hole, but if you’re looking for accuracy and penetration, this will be a great broadhead to try. It also is an excellent broadhead for bows that aren’t tuned well due to it’s field point like accuracy. The Shape Shifter broadhead is also an excellent choice on windy days that would make shooting other wind catching broadheads a bad choice. If you’re looking for a new super accurate broadhead to try, go and pick up some Innerloc Shape Shifter broadheads. For more information, visit their website at http://www.innerloc.com/. This extremely accurate broadhead flies like a field point and delivers excellent penetration. While the entry hole is small and its cutting diameter isn’t the widest on the market, it puts deer down; in our case in an average of 12.5 feet. How brittle is the shell cover of the broadhead and what the least draw weight recommended? Its like the clear cap on a ballpoint pen. It seems to work perfectly. Not sure of the minimum draw weight recommendation. I personally am not sure. I would advise contacting Innerloc with that question. Thanks and good luck!